Verismo, UNI Suzuki School's Chamber Music Program Click here for more information. Welcome to the UNI Suzuki School! Active links (purple text) will guide you to more details. The mission of the UNI Suzuki School is to enrich the lives of children and adults through the study of music. 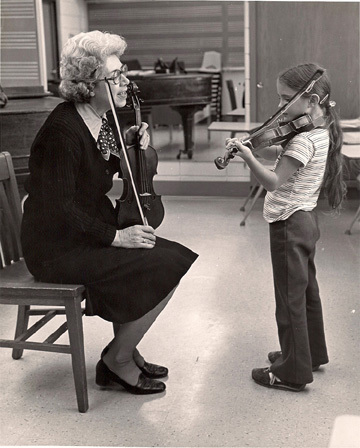 The UNI Suzuki School has been a musical home to families in the Cedar Valley and NE Iowa since 1976. The school is located in Russell Hall at the University of Northern Iowa. Guided by the teachings of Dr. Suzuki, we believe in the potential of all children to learn within the framework of the parent-teacher-child relationship. Our teachers work in a collaborative setting. Parents provide a vast network of support for families. Visiting clinicians (from the university, wcfsymphony and beyond) provide musical opportunities. We offer weekly lessons and group experiences with highly qualified music educators in violin, viola, cello and guitar. Performance opportunities, a music theory curriculum, chamber ensemble opportunities, youth and junior orchestras, adult chamber music ensemble and music related social activities enrich your experience with us. A variety of resources, including rental instruments, is available. Enriching the lives of children through music since 1976. We have a spot for your family. Learn more...click here or any purple text throughout the website. Click here for the latest news.